The local government in Zunhua, North China's Hebei Province vowed to better protect the city's cultural sites and relics after tombs in which date back to the Qing Dynasty (1644-1911) were looted twice in seven months. While the State Administration of Cultural Heritage (SACH) has blamed the local government's irresponsibility and poor management skills, experts noted that stamping out tomb raiding is both legally and financially challenging. Demand for historical artifacts in China is increasing rapidly. Aside from collectors, private museums are the major buyers of stolen relics, Ni Fangliu, a Nanjing-based archeology expert, told the Global Times. SACH summoned city officials from Zunhua and Tangshan, which administers Zunhua, after the October theft and officials promised that they would do more to protect the site. However, on May 17, the tomb of Empress Xiaozhuang (1613-1688) in the complex was burgled. The thieves have not been caught, and the case is still being investigated, according to chinanews.cn. "The local government and the administration department should improve their management abilities as well as their sense of responsibility," a official from SACH told the Beijing Times. The Eastern Qing Tombs has 15 tombs and 586 individual buildings which house the remains of 161 imperial family members, according to the Xinhua News Agency. "It is difficult for the government to control such a large place, and some tomb thieves have more advanced technology than the government," said Ni, emphasizing the shortage of funds for relic protection. 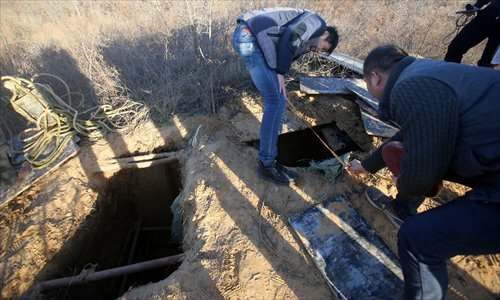 "The relics they stole from these tombs can be sold within few days, which makes it very difficult for the government to trace these relics," said Liu Yang, a Beijing-based lawyer. According to SACH, just 29 incidents in which relics were stolen were reported to them in 2015, along with 83 cases in which cultural sites were vandalized. About 22 heritage sites under state protection reported cases in which their security was endangered, the Beijing Times reported. "Many private museums have a large demand for relics, which gives tomb looting a huge market," said Guo Dashun, former director of the Liaoning Provincial Institute of Archaeology. In addition, the government is encouraging more museums to be built. "So even if they know that the source of these relics are questionable, they turn a blind eye to it," said Ni. "If these museums refuse to take the illegal relics or report the thieves to the police, then no one is going to give them relics any more," Ni explained. Liang Jun, the curator of a museum in East China's Jiangsu Province was sentenced to nine months in jail with a year of probation and fined 100,000 yuan ($15,013) for buying relics from tomb thieves, news site sina.com reported in 2014. Ni argues legal and security solutions are needed "Yet currently neither of them seem possible," said Ni. China stopped handing out death sentences to tomb raiders in 2011 "in order to decrease the number of executions," said Liu. "Undoubtedly tomb looting will be more and more rampant without the threat of the death penalty," said Ni. With the lessening punishment, expanding market and some local governments' negligence, "maybe the tomb looting business will only die down when all the tombs are depleted," said Ni.